Holiday Eco friendly and Fun: Earthday Everyday Holiday Email Greetings,Crafts,Games,Activities,Fun Food Art Articles Ideas Tips More! 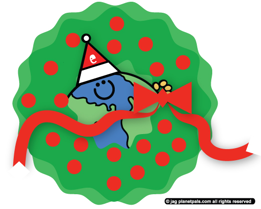 Planetpals Holidays....Summer, Winter, Spring or Fall...Planetpals has it all. Check out the earth calendar for earth and peace related holidays, too. Two patterns. Shows you how to make stationery to send to your friends out of paper. Green Earthday Journal Activities, Craft, Ideas, Tips, Food, Art, Articles, Complete guide. Activities, Craft, Ideas, Tips, Food, Art, Articles, Complete guide. GREEN Thanksgiving Journal Activities, Craft, Ideas, Tips, Food, Art, Articles, Complete guide. GREEN HOHOHO Holidays Journal Activities, Craft, Ideas, Tips, Food, Art, Articles, Complete guide. Print, Design, Cut, Hang this sqaure box shaped ornament for any holiday! With pattern. Learn about the Japanese art of paper folding. Make an Origami star ornament from paper squares. Make one for your tree, or several to decorate your house or presents! T wo patterns. Shows you how to make stationery to send to your friends out of paper. Print, Design, Cut, Make ornaments, cards, tags for any holiday! Activities, Craft, Ideas, Tips, Food, Art, Articles, Fun New Year Facts Worldwide Complete guide. See everything on the site with the complete site map!